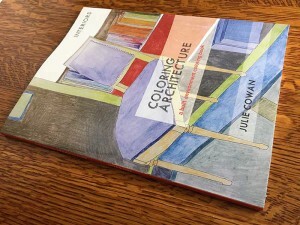 Coloring Architecture – A coloring book for kids and adults! We finally did it! – We published a coloring book with drawings from the inside of houses – interiors – and we want you to color them! Some are simple and easy to color in, others are more complex. All will look great once you color them in and tear or cut them out and hang them in YOUR interior space! Julie Cowan is the author – well, the artist – that drew the images and colored the cover. You also might try to color “Coloring Architecture” with a pattern. We suggest that you tear or cut out the pattern pages in the back of the coloring book. Tape that pattern on a window or light table. Then pick out an interior page of the book. Tape it on top and trace the pattern onto the walls or the carpets or the furniture. Then color that pattern in too! You can create your own space and design. We think you will love it! Also see http://coloringarchitecture.com for more information. Please email photos of you coloring the pages or you with your finished coloring pages to us and we will post them here on our site. 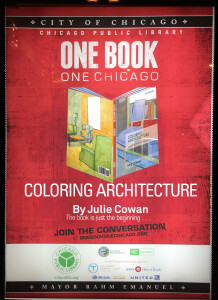 Is it really the One Book Chicago?